The time spent on the vision, values etc. last term was the foundation for the structures coming into place over the past 2 weeks. All our decisions in putting these in place are well grounded in the school vision and values. Then in one day this week we introduced the staff to all the structures supporting the delivery of our curriculum: the different modules that will be offered, the weekly timetable, how the modules will be developed and how the teaching teams are formed. Big Modules which will involve 3 different teachers integrating and team teaching together (students will be presented with 3 of these big modules to select into). These have 3×90 minute blocks a week. Small Modules which will involve 2 teachers working on a connection together and of which students will take 2 of these in a term. These have 2×90 minute blocks a week. Spin Modules which are 1 teacher and provide for a more specialised and higher personalisation of the curriculum. They are more likely to be discipline specific but could also involve specialised interest areas such as robotics, languages etc. These have 1×90 minute block a week. 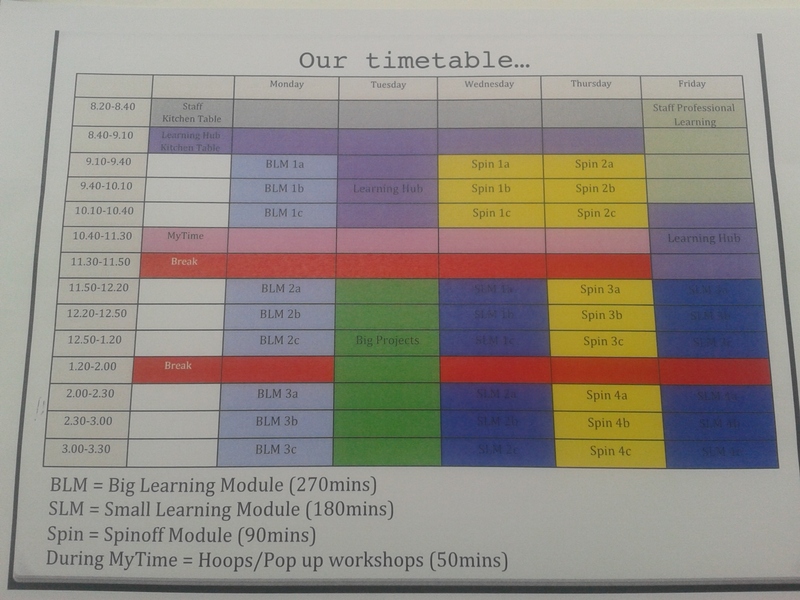 Hoops Modules which are pop-up needs based modules that will occur in the MyTime (flexi-time) built into our timetable. 5 students struggling with a key skill or concept? Lets run a Hoops module Tuesday next week and we can work on it further! Together these form the “Specialised Learning Modules” part of our curriculum and timetable. All of these modules will go through a planning process that involves both the cross-curricular teams and some Learning Area check-ins so that we maintain the rigour of the separate disciplines whilst making use of the authentic links that exist. I was excited but quite anxious about presenting these to the staff. As a team we really felt that something great had been developed. The response from staff was phenomenal! Of course there were questions and challenges put to us about different aspects of the structures but I would be worried if these didn’t happen. The overall feeling was an excited buzz – both in the room and on the twitter back channel that grew as more and more staff started sharing their excitement online. For some reflections from other staff members see Sally’s blog or Maurie’s blog. If last term was the foundation for these structures, we hope these structures are the foundation or enabling constraints for creative pedagogy to occur. Sufficient structure and sufficient openness are both required to enable creativity in learning. Davis et al. give the example of a learning intention “Students will write creative poems this lesson” as one that is too open and requires more structure for learning to be successful. A more enabling learning intention would be “Students will explore poetry-writing processes through inventing characters and plots based on unfamiliar items and unexpected juxtapositions”. This learning intention has sufficient constraint and openness to produce the creative mix necessary for complex emergence to unfold. The structures outlined above are about setting up the institutional level enabling constraints that provide the conditions necessary for creative pedagogy and learning to occur. This process emerged naturally from our deconstruction of the New Zealand Curriculum and only 2 words made the ‘final’ cut from outside that document. Still in draft form, we are hoping to have a graphic designer turn the circle shapes into interlocking river stones or similar to represent the non-linear learning we envision. Learning can start at any of these stages and the critical reflection and evaluation at it’s heart should occur continuously. This reflection or questioning will determine which stage you move to next. Bryce described this perfectly as like a wormhole, you cannot certainly say where you pop out after the reflection. It is a process that will see learning using and creating knowledge rather than just simply seeing students filling up with knowledge and regurgitating it. Combining the enabling constraints of the school structures with the learning design model gives me a strong sense that the schooling transformation we have been envisioning is not only possible, but actually now in the process of actually occurring. 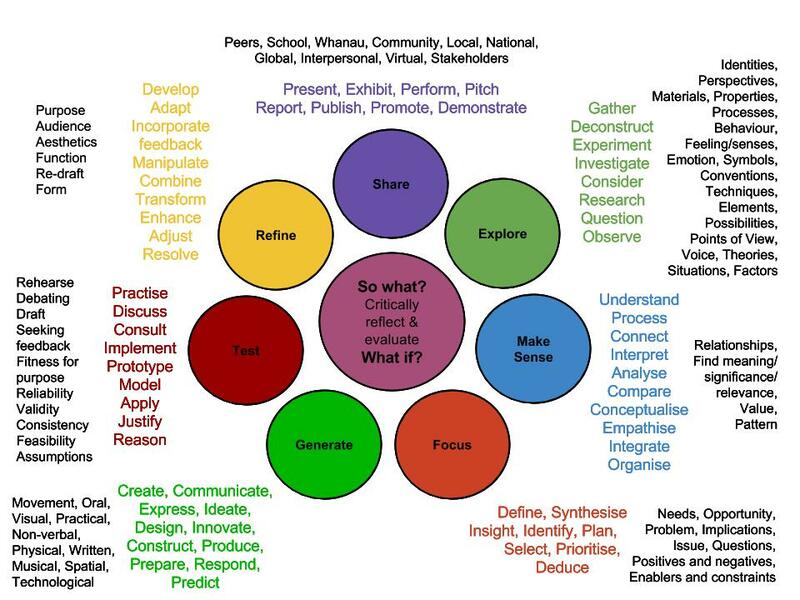 This entry was posted in Uncategorized and tagged 21st Century Learning, complexity, curriculum, design thinking, education, enabling constraints, Hobsonville Point Secondary School, learning, Modern learning environment, New Zealand Curriculum, school structures, schooling, Secondary School, thinking, timetable by stevemouldey. Bookmark the permalink. Thanks so much Penny, look forward to you visiting when we are open next year! Wow, this is awesome, for two reasons. Firstly you guys are not only challenging the industrial designed schooling we have come to just accept, but you are putting yourselves out there and finding new and innovative ways to facilitate learning in the future. Well done, will be following your journey with interest! Wow Steve! Congratulations this sure does look exciting. I am looking forward to hearing how the implementation stage goes. Good luck! Thanks so much for such a great blogpost Steve. I am going to share it as a great example of creating a learner focused curriculum and how you have woven through the complexity of change. I’m looking forward to following your journey. Thanks Cheryl. It has been an incredible experience and the leadership team of Maurie, Di, Claire and Lea have been absolutely inspiring. Now we are having the joy of seeing all that hard work pay off as the students experience the curriculum for real. 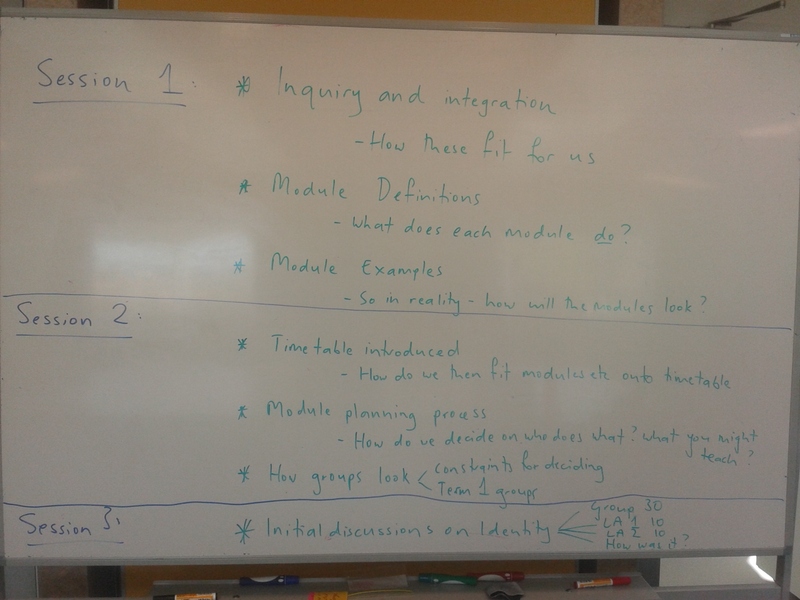 Kia ora Steve love your 8 most powerful conceptual connections that you came up with for your new carriculum framework.. These are the sort of values that need to be incorporated in the creation and development of the new Aranui campus where 4 schools are closing in 2016 and becoming one new Campus in 2017. They have all surfaced in our vision for the new space. thanks for the comment, the 8 connections came through really clearly for our team and also relate really well to the Hobsonville Habits we are developing with our learners. Hopefully our process provide a nice launching pad for your team as you start on an amazing adventure as well. As things progress, I hope you and your team get a chance to come up and korero with us about our experiences.